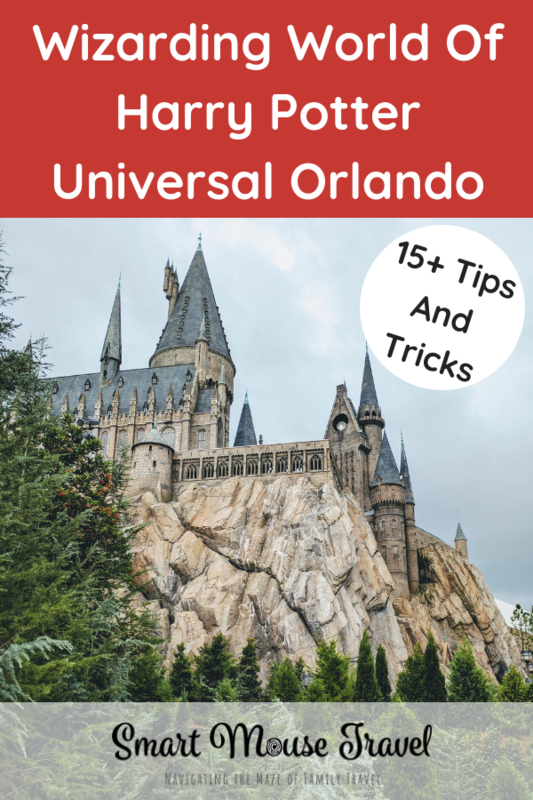 Whether you are a huge Harry Potter fan (like Elizabeth and me) or a muggle just here to see what all the fuss is about (the rest of my family) these top tricks and tips for Harry Potter Orlando will help you get the most out of your day. And since not everyone else knows this stuff you will look like a pro and impress your friends (or maybe even strangers)! 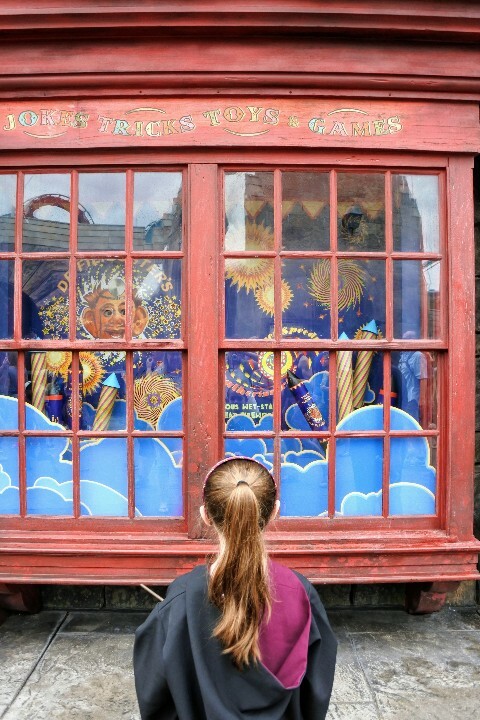 Looking for more on the Wizarding World of Harry Potter Orlando? Read my essential guide. 1. Changes to Express Pass means you get to skip more lines in the Wizarding World of Harry Potter. The Express Pass will now let you skip lines at Harry Potter and the Forbidden Journey, Hogwarts Express, and Flight of the Hippogriff in Hogsmeade. Express Pass is also available for Hogwarts Express and Harry Potter and the Escape from Gringotts in Diagon Alley. 2. To get a video of someone in your group walking through platform 9¾ make sure you send them ahead of you. The ‘disappearance’ only works if you are on the opposite side of the luggage trolley. If you are directly behind the person walking through platform 9¾ it only looks like a regular opening in the wall. 3. The dragon above Gringotts breathes real fire! Keep your eyes and ears open to see the Ukranian Iron Belly dragon breathe fire. 4. If you have an interactive wand from Universal Studios Hollywood it will work at Universal Orlando in both Diagon Alley and Hogsmeade. The only downside of bringing your wand from Hollywood is you won’t have an accurate map. Keep an eye on the ground to find bronze plaques since this will show you where and how to perform magic spells. 5. 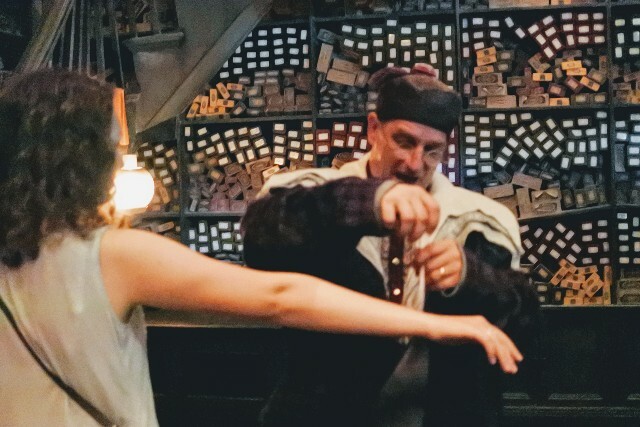 Although there are other places to buy wands in the Wizarding World Of Harry Potter, try and see the wand fitting at Ollivander’s. The interactive experience is a lot of fun and you might even get picked to participate! 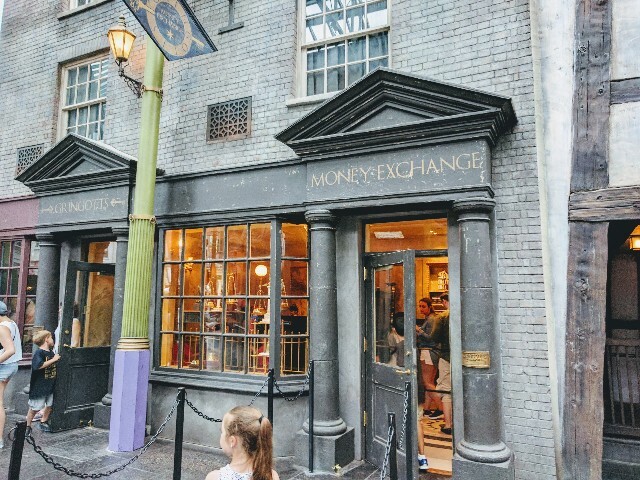 There is an Ollivander’s wand shop in both Diagon Alley and Hogsmeade. 6. If you are chosen for a fitting during the interactive show you aren’t obligated to buy that wand. 7. Knowing the first four Harry Potter books or movies helps to really enjoy Diagon Alley, Hogwarts, and Hogsmeade. There are an especially large number of references to both Prisoner of Azkaban and Goblet Of Fire. 8. To ride the Hogwarts Express from King’s Cross to Hogsmeade Station or vice versa you will need a park-to-park ticket. To enter the line for the Hogwarts Express you will need to scan your park ticket and matching fingerprint to be granted access. 9. 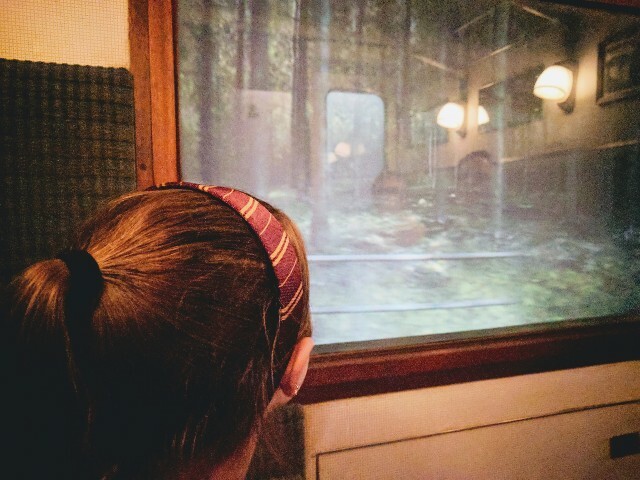 The ride from King’s Cross to Hogsmeade has one experience. The ride from Hogsmeade Station to King’s Cross has a different experience. Try and do both! 10. 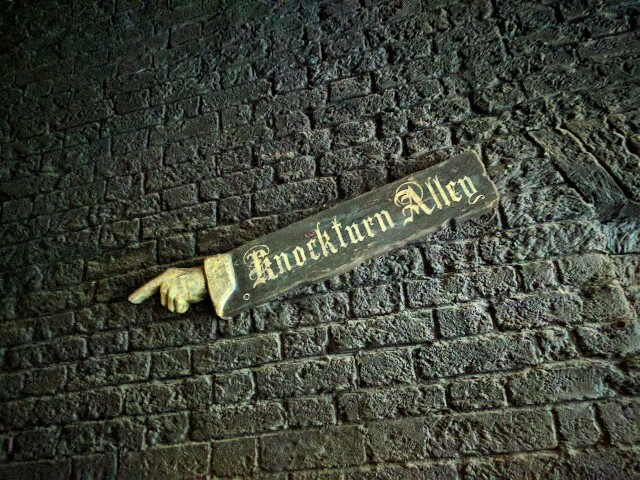 When you are in Diagon Alley, make sure you take a “wrong turn” into Knockturn Alley. Knockturn Alley is similar to Diagon Alley, but shops are geared toward Dark Wizards. It is cold, dark and has some really fun spots to make magic with your wand. 11. 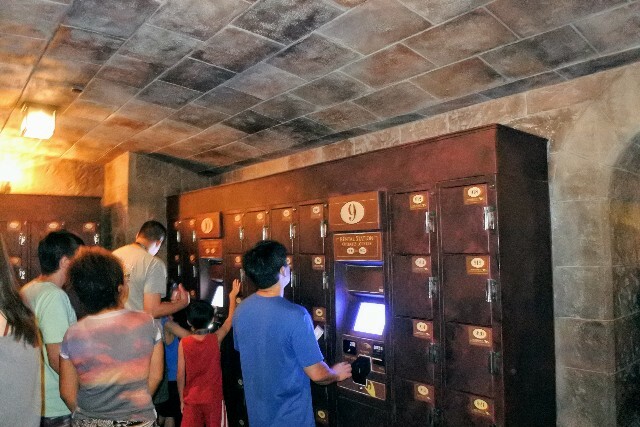 Some rides (Harry Potter and The Forbidden Journey and Harry Potter and The Escape From Gringotts) require you to store all bags in a free locker. Familiarize yourself with the locker process before you go to avoid a lot of hassle. The lockers are surprisingly complicated, so be sure to check out my step-by-step guide to using the lockers at the Wizarding World. Some lockers now have a fee and you can find out more about that here. 12. The lockers do not accommodate all backpack sizes. I had a much easier time fitting my North Face Women’s Isabella in the locker than my North Face Borealis. The Borealis required shoving, sweat and prayers to fit inside the locker. The Isabella fit without any trouble. 13. Inside Honeydukes (and other sweet shops) you can find many candies from the books and movies. 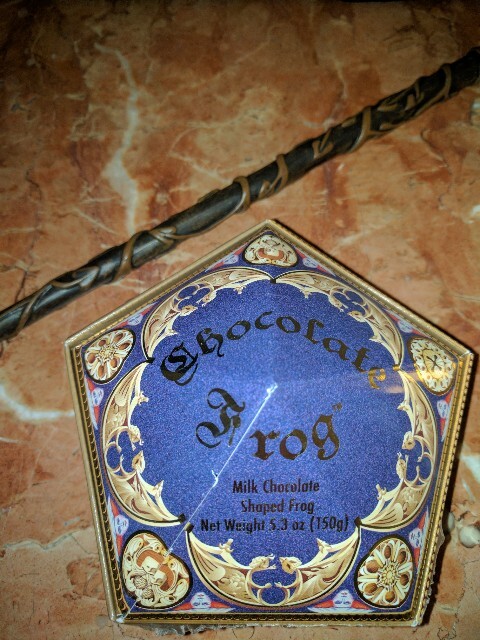 Some examples: Bertie Botts Every Flavor Beans, Chocolate Frogs, and Ton Tongue Toffees to name a few. 14. You can send mail and have it postmarked from Hogsmeade. To do this you will have to purchase an official postcard pack and stamps from shops inside Diagon Alley or Hogsmeade. 15. You can turn your muggle money into wizarding cash. Gringotts Money Exchange will convert dollars into wizarding paper money to be used inside the Wizarding World of Harry Potter. If you want wizard coins be aware those only come in a commemorative box set. 16. 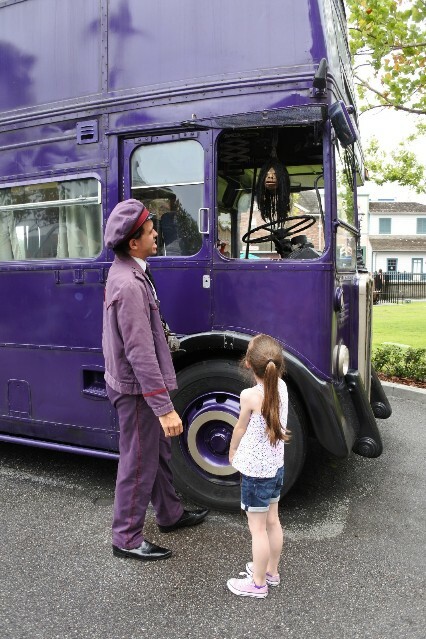 You can meet Stan, the Knight Bus conductor at the Knight Bus just outside Diagon Alley and King’s Cross. Stan and the shrunken head will chat with you about wizard life. 17. The specialty drinks are pretty good! Frozen Butterbeer was a hit with my mom and me. Elizabeth loved the Tongue Tying Lemon Squash which was basically a tart homemade lemonade. 18. Listen for Moaning Myrtle when you are in the loo. If you listen closely you can hear Moaning Myrtle talking and moaning while you are in the bathrooms. 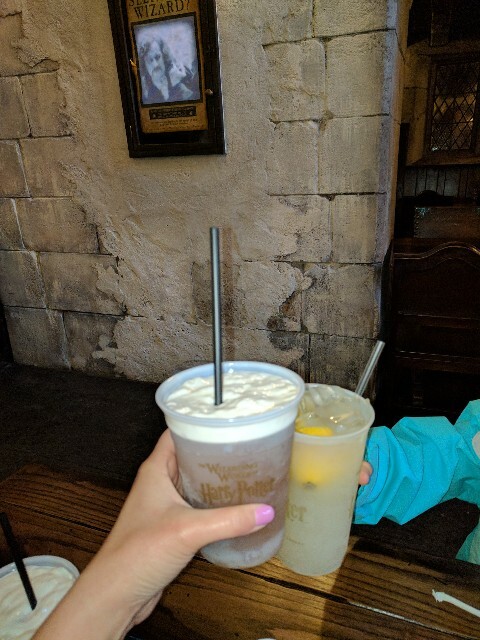 There is so much to see and explore at the Wizarding World of Harry Potter in Orlando, and now you know all of my favorite Wizarding World tips and tricks for your visit! I hope you love Diagon Alley and Hogsmeade as much as we did. Did I forget one of your favorite things about the Wizarding World of Harry Potter in Orlando? 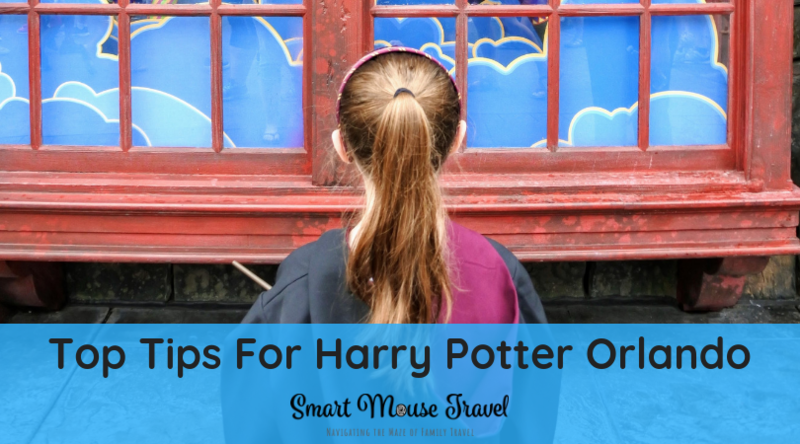 Or do you have tips for Harry Potter Orlando? Let me know below in the comments. Previous Post:What are runDisney Virtual Running Shorts? wow I think we are going to start reading HP soon, so def will be planning a trip to WWHP! The Harry Potter World is such a great adventure! Even for me, who am not a teenager anymore. I especially like the 4D attractions because I’m afraid of height. So fun! My family and I have just started reading the HP books together. (We’re on book 3 right now.) I definitely think a trip here is in our very near future. It looks like so much fun!! !